This Hohokam point was found several years ago in the Phoenix basin area in south central Arizona. It dates to the Sedentary period sometime between A.D. 900 to A.D. 1100. There are several different styles of Hohokam points. The larger finer examples have a very unique and distinctive shape. They are generally triangular in outline and many are serrated. Some have side-notches and other examples, like this one, do not have notches. This example is serrated from the base to just below mid-length. 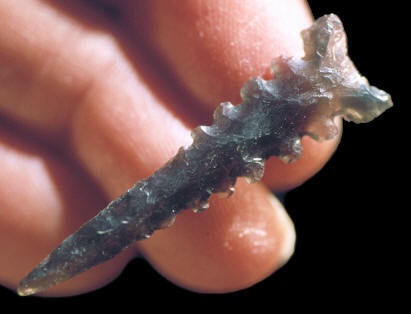 It also has the classic Hohokam style long narrow “spiky” point. This Hohokam point is made of semi-translucent Obsidian. It measures 1 11/16 inches (4.3 cm) long. The Hohokam people were prehistoric farmers who lived on approximately 45,000 square miles of land in the Sonoran Desert of south central Arizona. The name Hohokam is usually reserved for the pottery-making people who lived between A.D. 200 and 1450. Many of their houses were built together in small clusters or on isolated locations. They also built large settlements that were well organized around plazas, ball courts and platform mounds. The Hohokam people also built the largest prehistoric canal system in North America. Mexico had a strong influence among the Hohokam in both trade and culture. Rubber from the Mexican lowlands was used to make balls that were used on their elaborate ball courts. The game may have been similar to the one played in 14th century Mexico. It was similar, in some ways, to soccer and basketball but with no hands allowed.